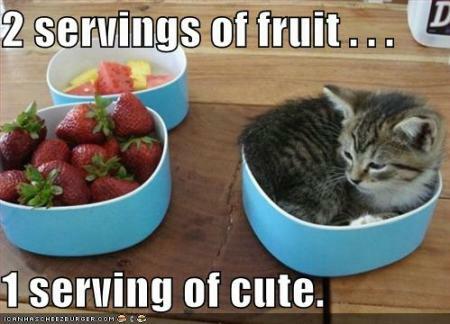 Two servings of fruit and one serving of cute. Sounds like a perfect combination to me. Fruit for breakfast is a great way to start your day, but don’t forget about your soul. You need to feed your soul as much as your body when you are learning how to eat healthy. Giving yourself some cute kitten time is the perfect recipe for your morning soul feeding. Photo via: 2 servings of fruit . . . Â« Lolcats â€˜nâ€™ Funny Pictures of Cats – I Can Has Cheezburger? If you have a Nike+ iPod, don’t forget the Starling Fitness Challenges on Nike+. It’s a chance to run with people on your own level. They add a fun bit of competition to your daily workout. We have these challenges EVERY week, so join up and start running with us. If you DON’T own a Nike+ iPod (or even if you do), you can still compete on Runner+. Challenge: Starling Fitness Level 1 (09-29-08) – RUNNER+: Runs between 0-10 miles a week. If you run more than 10 miles a week, you will be disqualified. Challenge: Starling Fitness Level 2 (09-29-08) – RUNNER+: Runs between 10-20 miles a week. If you run more than 20 miles a week, you will be disqualified. Challenge: Starling Fitness Level 3 (09-29-08) – RUNNER+: Runs between 20-30 miles a week. If you run more than 30 miles a week, you will be disqualified. Challenge: Starling Fitness Level 4 (09-29-08) – RUNNER+: Runs between 30-40 miles a week. If you run more than 40 miles a week, you will be disqualified. Challenge: Starling Fitness Level 5 (09-29-08) – RUNNER+: Runs between 40-50 miles a week. If you run more than 50 miles a week, you will be disqualified. Challenge: Starling Fitness Level 6 (09-29-08) – RUNNER+: Runs between 50-60 miles a week. Right now, there is no maximum mileage limitation. Run to your heart’s content! There are the same levels on the Nike+ runs, but I can’t link to them because Nike’s site is so phenomenally stupid. If you have been feeling stale with your walks or runs, join a Starling Fitness Challenge and add a bit of spice into your workouts. I don’t care for peaches. Unlike apples, nectarines, pears and plums, I don’t like to eat that fuzzy skin on the outside. Having a slimy pit to deal with at the end is bad enough, but that fuzzy skin is just unappetizing. Then again, I’m perfectly willing to eat apricots. I LOVE apricots and I miss the tree that my parents used to have in their backyard. I hated picking up the rotting and disgusting apricots that had fallen from the tree, but I DO miss the fresh fruit. The fuzzy skin on them doesn’t even phase me, so why don’t I like peaches? Is it just the pit? With an apricot, I can pop it open and dispose of the pit easily, but with a peach, the fruit clings to the pit with a vengeance. I guess the combination of a slimy pit and fuzzy skin is just enough to push peaches off the list of favorite fresh fruits. 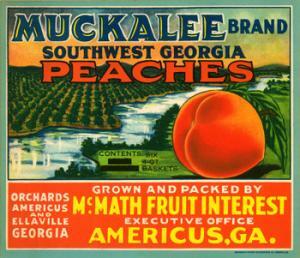 Canned, peaches, however… I LOVE those. I don’t like the kind that have heavy syrup, but packed in juice or water, they’re delightful. If someone else has gone to the trouble of removing that furry skin and gooey pit, I’m perfectly happy to eat a peach. Lucky thing, too, because adding peaches to my diet means that I won’t get sick of fruits and vegetables. 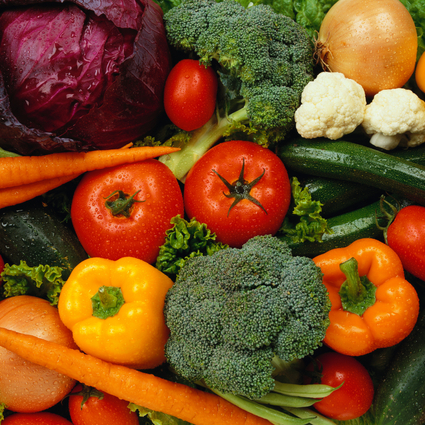 Are there any fruits or veggies that you don’t like to eat? If there are, try them prepared in a different way. It might make the difference between dieting boredom and dieting success. After checking the WW Points for this recipe, however, I was a little less than happy. It clocked in at 19 Points! Since my biggest problem with a piece of chocolate cake isn’t the piece of cake, but the rest of it in my house, the idea of making one serving of chocolate cake sounded perfect. I wouldn’t have to worry about bingeing if I only made one piece of cake. So I altered the recipe. Add the milk and applesauce and stir until mixed well. Cook in the microwave for 3 minutes on high (1000 watt). 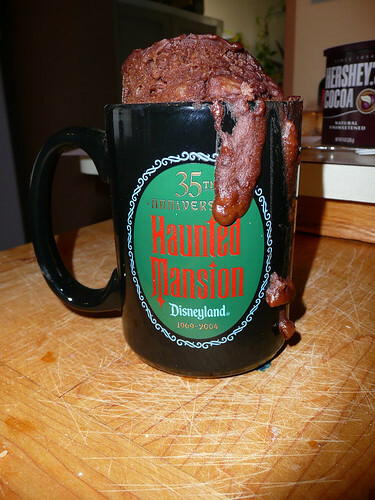 Allow to cool before popping the cake out of the mug. Despite the appearance of the mug, it didn’t make a mess in my microwave. The bubbling cake mixture never made it all the way down the mug before firming up. The cake will be spongy, but moist. It’s not sickly sweet like some cakes are. If you want a little more sweetness, add a tablespoon of frosting for an additional Point. The cake is so large, I cut it into two servings. Allow it to cool before eating and it will be less spongy. When I was a kid, microwaves were the cool new thing and they made cake mixes for the microwave. I could make a personal cake whenever I wanted. Honestly, I’ve missed that a little bit and it’s nice to know that I can make myself ONE piece of cake and not have to worry about throwing the rest away. It seems that tasks that task your mind also task your appetite. Jean-Phillipe Chaput just released a study in the latest issue of Psychosomatic Medicine stating that intellectual work creates a destabilization of the blood glucose levels in the body and causes appetite spikes. ABC News: Does Thinking Make Us Fatter? The participants burned only about three calories more during each of the two “knowledge-based” experiments than during the 45 minutes when they rested in a comfortable chair. So the caloric expenditures were relatively quite low for mental tasks compared to the period spent relaxing. But the intake was significantly higher. Participants consumed 203 more calories after the reading experiment, and 253 more calories after the computer tests, than the resting participants. That’s an increase of 23.6 percent and 29.4 percent, respectively. Next time you feel yourself reaching for food when you’re working at the computer, remember that you haven’t really burned the calories you’re craving. Instead of a snack, take a brisk walk or a run up and down the stairs. That’s the pick-me-up that your body truly needs. My goal is to eat 9 servings of vegetables a day. I did this once years ago for three days and my skin GLOWED. It was an amazing and very noticeable difference. I looked SO healthy. I donâ€™t know why I stopped doing it, but Iâ€™ve wanted to do it again ever since. She provides a complete list of vegetables if you want to glow as well, so head on over to her blog and get yourself on the way to a healthier diet! Ask Laura: How Do I Choose The Right Shoe? I was googling something else and came across this blog entry. How does one go about finding the right work out tennis shoe? My foot (specifically the arch area) hurts sometimes when exercising (aerobic videos at home)â€¦my feeling is that itâ€™s the shoe, but I donâ€™t know how to choose the right shoe. The best thing to do is to go to a professional running store. Wear your exercise clothes and be prepared to run on a treadmill in front of the staff. The best places (like Nike, New Balance and specialized running stores) have treadmills in their stores so you can test out the shoes in action. I always say that I have to run a mile in a shoe to know if it will hurt me or not. In actuality, I usually only need to try it out for a minute, but it is SO helpful to have a treadmill at the store to try out the shoes. If you happen to live in an area without a specialized running store, your next best bet is Foot Locker. Try to go during a time when they are slow so you can get some personalized attention. My first shoes I bought at Lady Foot Locker and the girl there was so good she was able to find a shoe that felt good from the very first day. Other than trial and error (which is FAR too costly when shoes can run in the hundreds of dollars), there is no better way to get running shoes than to go to a professional running store for a fitting. What you pay in embarrassment by running or walking on a treadmill in front of strangers, you save in dollars in your pocket. If you are plagued by food cravings, even when you’re not hungry, then you might want to try a low-carb diet. I have severe problems with bingeing and have found myself eating even when my stomach is full. When I go low-carb, however, those cravings go away. If you want to be free from food cravings, here is a guide that should help you get through the first week of living low-carb. Eat lots of fiber and lots of fat. Plan delicious things to eat. Honestly, these are really good tips no matter what diet you are starting. If you want to be able to eat food like a normal person, limit your carbs and make sure you eat enough protein. I found that my constant desire to binge just drifted away and I was free! 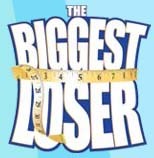 What Do You Eat When You Watch “The Biggest Loser”? I used to save episodes of The Biggest Loser until the next morning and watch them while walking/jogging on the treadmill. I found it so inspiring to see all those people working out. This year, however, I decided not to watch after seeing a preview clip of Jillian just screaming at a contestant. Every one of those people seem to feel guilty for eating while watching The Biggest Loser. Maybe watching that TV show isn’t all that good for all of us. Whenever Jillian screams at an overweight contestant telling him that he is going to stay on that treadmill until she tells him to get off or until he dies, maybe we feel like we deserve that sort of abuse. Eating while watching the show just makes it more deserved. Me? I’m skipping it this year… or at least I’m not watching for as long as I can. 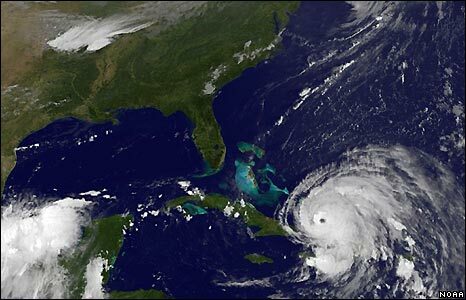 Now that Hurricane Ike has passed through Texas, I think of all the people who evacuated Galveston and Houston to avoid the hurricane. They knew it was coming, but not everyone got out.